Four season comfort, durability, great ventilation and quick set-up time are distinguishing features of the Kelty Foxhole 3 mountaineering tent. Part of the Kelty Apex Series of expedition level four-season tents, the Foxhole 3 is designed to take on inclement weather wherever you find yourself spending the night. Kelty’s Foxhole 3 is a freestanding tent you can guy out partially or fully depending on conditions you encounter. Kelty made good use of illumination materials on the large Kelty Foxhole 3 logos on the exterior of the tent, near the two entrances, and illuminating thread woven into the guy-out lines. At night, you can easily see where your tent is from a distance as the illumination glows perfectly clear in the headlamp or flashlight beam; even at the periphery of the beam. Also, when you are walking around outside the tent at night, the illumination strands woven into the guy lines let you know exactly where to avoid tripping accidents. Set-up goes fairly quick as the Dac ultra-light poles configure rapidly into an external frame that anchors in deep pockets at four-corners of the tent. The entire exoskeleton uses slider-clips and hook-clips to rapidly erect the core tent body so it’s taught and ready to stash your gear. Click to enlarge: Kelty Foxhole 3 in transport on a heavy Gregory Spear backpack; 12 Spears on this hike. It only takes one person to roll out the tent body, assemble the Dac-pole frame, slide four pole ends into the pockets, and clip up the tent. In addition, the guy lines can be adjusted with the ITW Lineloc guy line adjusters to batten down the hatches in severe weather. All seams are fusion welded and taped, increasing this tent’s capacity to withstand harsh environments. Ventilation is well thought out with or without the rain fly attached. Closable mesh panels allow you to open ventilation routes where you want air flow. With the rain fly attached, ventilation ports on the rain fly are propped open with short (about 3-inch) sections of Dac poles inserted into sleeves and secured in upright position with Velcro fasteners. This combination of rain fly ventilation working with the main tent ventilation system allows you to fully adjust to the current conditions at your bivouac site. Even in warm weather, you can still have the full protection of the rain fly without restricting the ventilation and cool air through the tent. The rain fly drapes over the exoskeleton — creating an air chamber between the tent walls and increased insulation – and fastens with side-release buckles to the main body of the tent. When securing the rain fly, you do have to match the two doors located caddy-corner across from each other on opposite sides of the tent. With practice, this becomes routine. With the rain fly secured and the entire tent guyed out, you have two roomy gear-storage vestibules and two door openings you can literally stand up in to put your boots on as the walls of tent slant away from the tent floor. 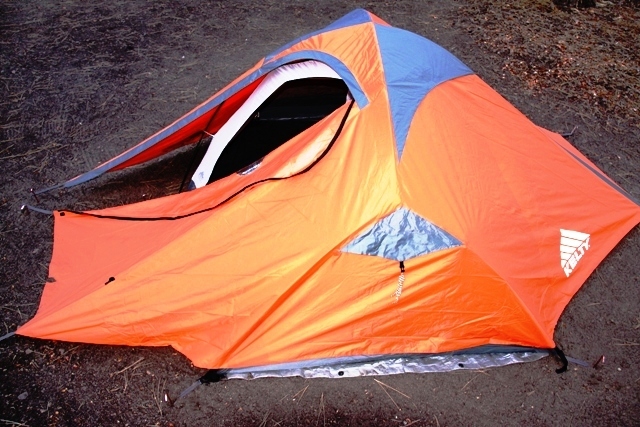 This design characteristic is convenient because you don’t have to step out of the tent, onto the ground, in order to stand up to full height. And these tent doors are especially nice for taller people as you won’t have to crawl out of the tent. Two clear windows are welded into the rain fly at the door openings. This is a cool feature as you do not have to completely unzip the inner tent door or rain fly door to check on the weather or to figure out what kind of mammal is tossing around the bear canister 50-feet away. Noiseless zippers worked well with the Foxhole 3. Zippers are stout enough to manage the taught tent fabric and tent walls without binding or making any racket. And because the tent design yields taught walls there are times when you have to balance the left-side zipper travel with the right-side zipper travel to close a door. But when an opening is fully zipped up, the tent wall is as tight as it needs to be to shed any moisture and withstand a snow load or stiff wind. Having two entrances and two vestibules add comfort and convenience value to this Kelty Apex Series Foxhole 3 tent. With three people using the tent, having two doors facilitates easy access in and out of the tent. And the vestibules offer enough room to accommodate the gear for three people. When lodging just one or two people, the Foxhole 3 takes claustrophobia right out of the equation. Kelty Foxhole 3 interior with Therm-A-Rest NeoAire mattress on right, and Sierra Design Arrow Rock 30 down sleeping bag. Fusion welded floor seams run up the sides of the tent to create a tub affect. This is great as any potential build-up of snow or water outside the tent during any single weather event is not likely to intrude into the tent. 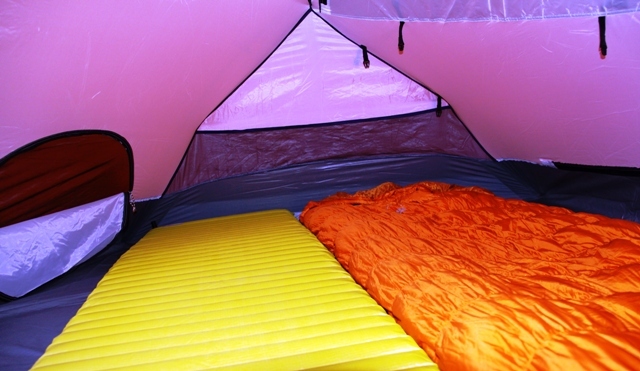 Tent floor material is 3000mm thick, polyurethane coated 70D polyester. When used with a footprint, you are assured of sleeping on as weatherproof a foundation as you could ask for in the backcountry. During the several trips this tent was on, at no time was there a sense the tent floor was too thin skinned or incapable of handling overnight moisture. Though we did not get into any heavy rain or snow events, there were several mornings of overnight frost and freezing; conditions that lead to condensation – none of which were a problem. Overall, the Kelty Foxhole 3 is certainly a solid choice to consider in a four-season, all-weather tent. There are some questions as to the ability of the tent hooks to withstand super-cold conditions without breaking, or becoming brittle over time. And the argument can be made that the main tent body may be better supported with a combination of pole sleeves (where the Dac poles pass through sections of tent sleeves on the upper portions of the tent) as well as the use of hooks to offer the strongest possible design, should the hooks fail. But this is a design philosophy tent makers continually wrestle with and improve upon. Even though the exoskeleton pole design appears complicated at first, we found this tent to be one of the most reliable and easy tents to set up quickly with just one person doing the task. Kelty Foxhole 3 tent without rain fly. Some folks just stuff the entire tent fabric into a backpack or stuff it into the stuff bag. I found it to be very convenient to fold the tent properly and roll the poles up with the tent. Each time, the tent rolled up quickly and fit into the Kelty stuff bag with no balking. For the comfort and shelter this tent provides, the weight is negligible. And when you plan on sharing this kind of tent with more than one person, then each person can carry either, the rain fly, the main tent, or the poles as separate units and thereby distribute the load. However, even for solo trips, at its full 9.4 pounds, the Foxhole 3 would probably be the first nine pounds loaded into the pack. The Kelty Foxhole 3 tent is simply a sturdy shelter to look forward to at night. Although each person has to assess the qualities and attributes they want in a four-season tent, the Kelty Foxhole 3 is a good shelter I’d recommend potential tent buyers to consider. Floor size: 45 sq. ft.
Vestibule areas: 9.4 sq. ft.
Click to enlarge: Kelty Foxhole 3 rainfly vent supported by section of Dac pole and secured with velcro. Click to enlarge: Hook-clip attached on Kelty Foxhole 3. Click to enlarge: Kelty Foxhole 3 tent components ready to set up. Kelty logo on Foxhole 3 tent pops with illumination when headlamp beam hits it at night. There’s a big Kelty logo on both sides of the tent. Click to enlarge: Kelty Foxhole 3 zipper at top of door, when closed, is taught like it’s supposed to be. Hook-clip attached to Dac tent pole on Kelty Foxhole 3.